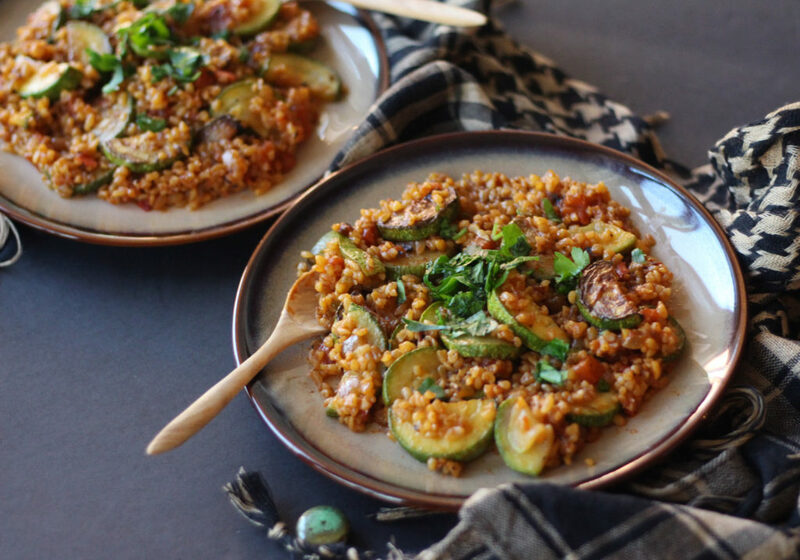 This simple bulgur pilaf filled with Arabic zucchini, or kousa (also known as Mexican gray squash) requires only 6 simple ingredients and 30 minutes to make! It is one of my go-to lazy day dishes, but although it is so simple and easy to make, it is not lacking at all in the flavor department. 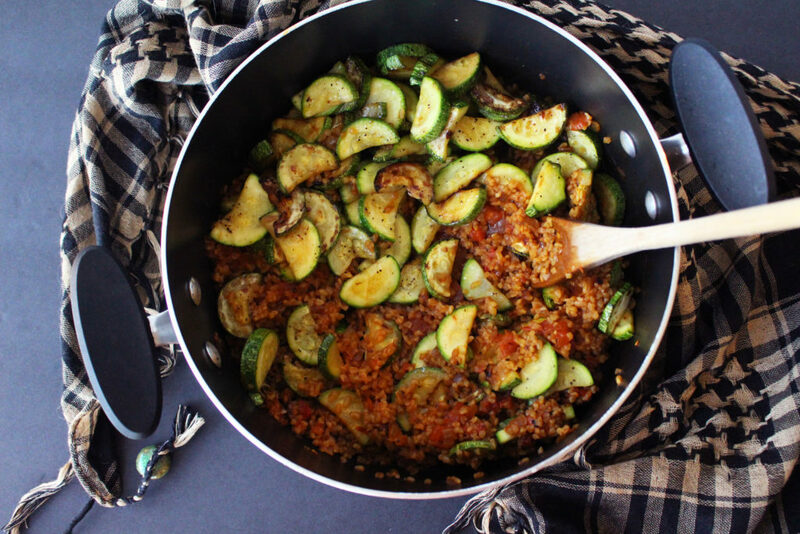 Zucchini was always one of my favorite vegetables growing up. My mom always made a variety of sautéed and stuffed kousa dishes, and I learned that simply cooking it on its own with olive oil, garlic, some onion, salt and pepper is one of the most delicious ways it can be prepared. 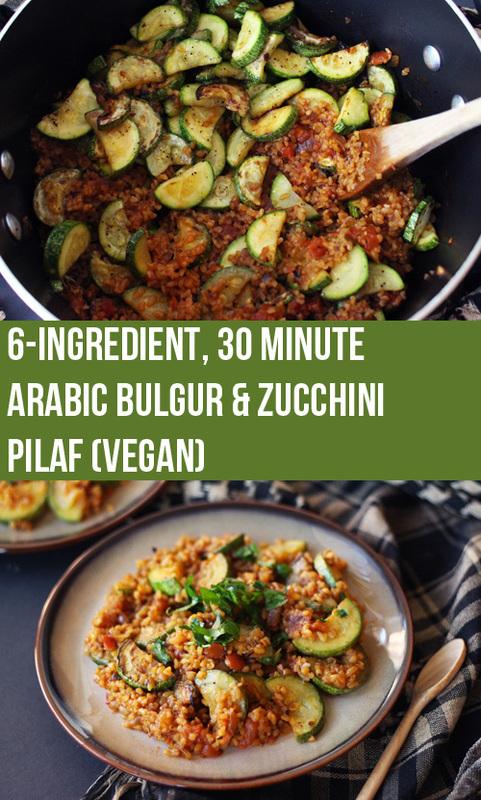 I love the texture of cracked bulgur wheat, or burghul as we call it in Arabic. It soaks up all the tomato juices and flavors wonderfully while remaining dense, yet fluffy and soft. It is also nutritionally dense, contains no fat, and has less calories than brown rice! It also has more fiber than many other grains, including buckwheat and oats, and almost twice as much fiber as rice! I love to make a big batch of this dish as it is a filling, complete meal, but it also works as a delicious side dish. Let me know if you try this recipe in the comments below, or pin it for later! And I would love to see your recreations on Instagram @zenanzaatar! ???? 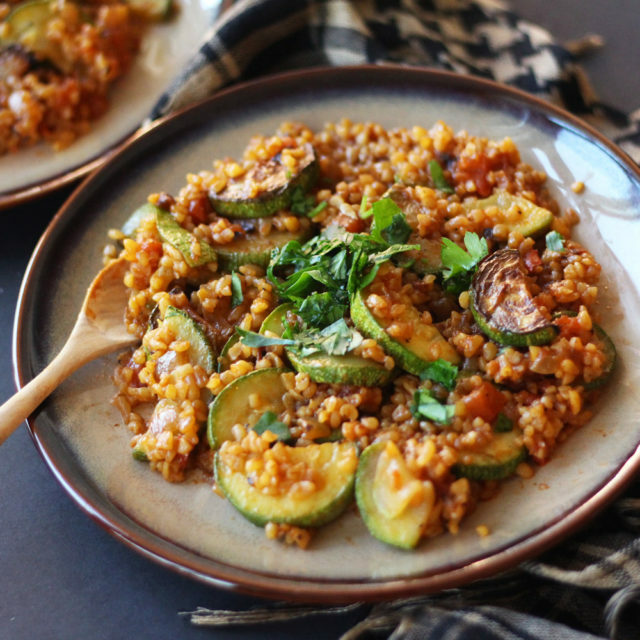 A simple 6-ingredient, 30-minute bulgur pilaf with Arabic zucchini and fragrant tomato sauce. Slice zucchini in half lengthwise and then chop into small half-rounds. Sauté in 1.5 tbsp olive oil and sprinkle with ½ tsp salt. * Cook until lightly browned, yet still crunchy, about 5 minutes, and set aside. Sauté diced onions in 1.5 tbsp olive oil in a pot over medium high heat until browned, about 5 minutes. ** Add minced garlic, tomato paste, and diced tomatoes, and stir to combine. Rinse and drain bulgur and add it to the pot along with the water. 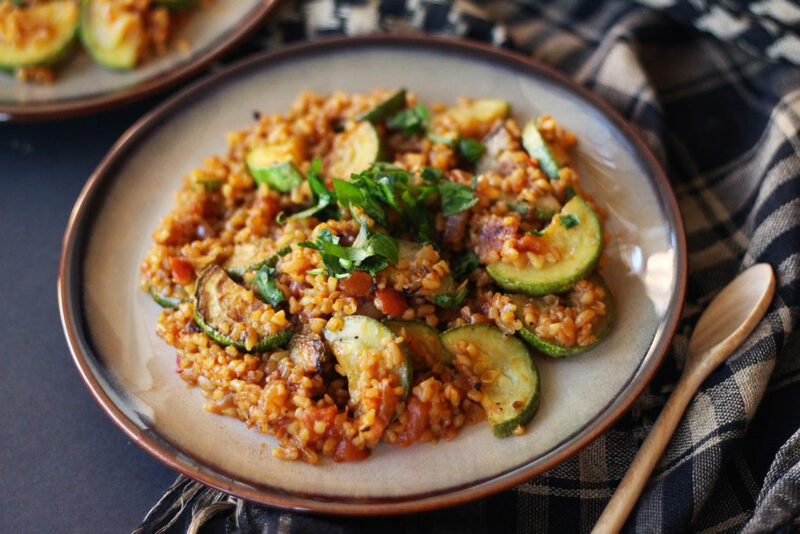 Bring the bulgur, water, and tomato mixture to a boil, add remaining salt, and simmer for 12-15 minutes, until bulgur is soft and has absorbed the liquid. 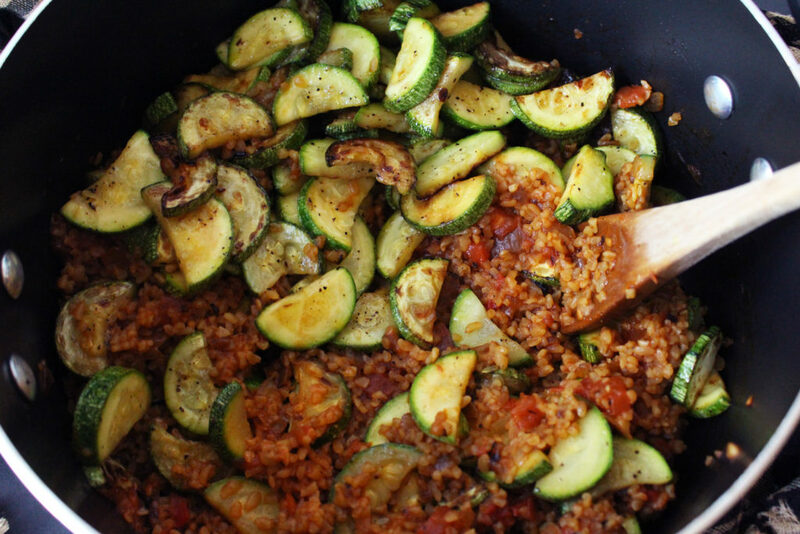 Stir sautéed zucchini, black pepper, and half of the parsley into the pilaf. Remove from heat after about 2 minutes. Serve immediately topped with extra fresh parsley. 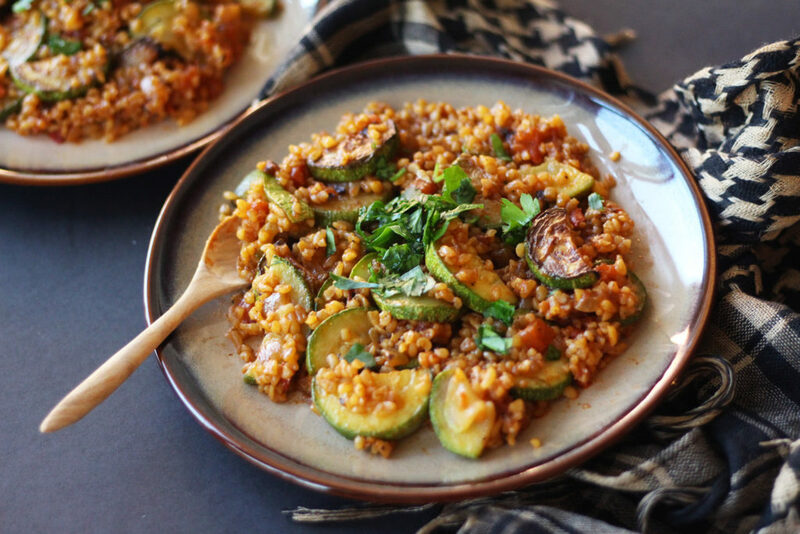 *For oil free method, sauté the squash with salt in a non-stick pan for a couple mins, until water is drawn out and squash is lightly browned. **For oil free method, sauté the onions in 2 tbsp water instead, until soft and translucent. This looks delicious and I absolutely love the name of your blog!! !